The Presbyterian Historical Society provides in-house digitization services for PC(USA) congregations, mid councils, and the general public. High quality digital facsimiles provide unlimited, remote access to collections and protect materials from damage and deterioration by eliminating the need to handle fragile originals. 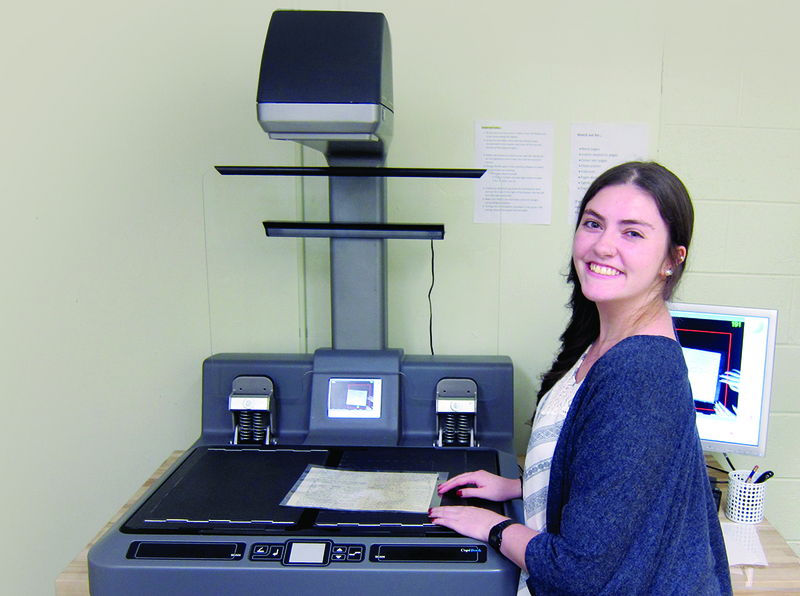 Digitization is available for bound or flat original materials up to 16" x 24" as well as for microfilm and filmstrips. Our CopiBook HD planetary scanner enables scanning of fragile and bound materials without the wear and tear caused by a flatbed scanner. To ensure the best quality images and to meet legal requirements, we only digitize original records, not photocopies. Domestic shipping is billed at a flat rate of $5.00. International shipments will be billed at cost. Please contact us for an estimate. Alternate file formats and resolutions are available by request. *Pricing for PHS Church Members at the Steward Level. **Digital surrogates are delivered as PDF files, and a PDF/A preservation master file is saved permanently at PHS. PDF/A is an ISO (International Organization for Standardization) standard Portable Document Format suitable for the long-term preservation of page-oriented documents. ***Please note: Documents are made text searchable whenever possible. OCR (Optical Character Recognition) software will not work with handwritten text, some older printed or decorative fonts, and certain languages. Select pages, images, and chapters will not be digitized. The society reserves the right to determine the reproduction medium and equipment used, contingent upon the condition, size, and quantity of materials requested. The society reserves the right to refuse an order if, in its judgment, fulfillment of the order would damage the item or involve violation of copyright law. There is a one-time $15.00 project set-up fee for general public digitization requests. Digitization requests under $50 must be paid in full in advance. All orders (except microfilm scanning requests) estimated at $50 and over require a deposit equal to 50% of the estimated cost. The remainder of the cost will be billed upon completion of the project. Digitization orders require approximately 1 to 3 months to complete, depending on the size of the project. Microfilm scanning orders typically require 2 to 3 months. Large requests may require additional time. Please contact us for an estimate. All responsibility for copyright infringement, questions arising from copyright, and the use of reproductions is assumed by the person submitting the digitization request. The copyright law of the United States (Title 17, United States Code) governs the making of reproductions of copyrighted material. Under certain conditions specified by the law, libraries and archives are authorized to furnish a reproduction. One of these specified conditions is that the reproduction not be used for any purpose other than private study, scholarship, or research. If a user makes a request for, or later uses, a reproduction for purposes in excess of this fair use, that user may be liable for copyright infringement. Interested in requesting digitization? Contact [email protected] or call (215) 627-1852. Submit a letter from the clerk of session or stated clerk authorizing us to digitize your records, including instructions about whether or not we should hold your records on deposit. The society will store your records in our climate-controlled archives free of charge and provide you with limited reference services in your records. You retain ownership. Make an inventory of your records; arrange them in correct chronological sequence and identify them so we understand what they are. Remove all fasteners and loose papers you do not want digitized. Please do not use adhesives (i.e. Post-it™ notes or tape) for labeling as they will leave a residue that will eventually damage your records. If you are including binders, please do not lock the bindings. Pack records in a sturdy, corrugated cardboard box, densely enough that volumes are unlikely to shift, and insulated from the edges of the box with bubble wrap or wadded packing paper. We recommend shipping by United Parcel Service because of their tracking system. If you decide against digitization, or if you need your records returned to you once digitization is complete, we will ship your records back to you free of charge. 11 hours 36 min ago. Today’s #HistoricalFigureFriday honors Reverend James Patriot Wilson. Born in 1769 in Lewes, Delaware Wilson went on to graduate from the University of Pennsylvania in 1788. He initially studied law and was admitted to the Bar but the unexpected death of both his wife and brother led him to a religious path. He was ordained as pastor of the Presbyterian Church in Lewes in 1804 and in 1806 he accepted a call to lead the First Presbyterian Church in Philadelphia. He resigned as a much celebrated pastor in the spring of 1830 before he died December 9th 1830. Our portrait of Reverend Wilson was painted in 1807 by none other than James Peale the younger brother of Charles Willson Peale. This oil on canvas painting represents one of the many large portraits James Peale completed after he shifted away from miniatures. To see more works by James Peale visit PAFA The Pennsylvania Academy of the Fine Arts or the Philadelphia Museum of Art.